Abu Dhabi National Oil Company (Adnoc) has signed MoUs with two leading Austrian groups – energy giant OMV and leading provider of innovative plastics solutions Borealis – to explore new opportunities for collaboration in the downstream sector. “OMV brings world-class expertise and advanced technology that will enable us to further stretch the value of our crude and secure greater returns from the global growth in demand for petrochemicals as we accelerate delivery of our 2030 smart growth strategy. This is yet another stepping stone in our journey to grow Adnoc’s downstream portfolio and establish Ruwais as a global refining and petrochemicals hub,” he stated. “Moreover, we are following our strategy of expanding the value chain and further strengthening our petrochemical business, as well as contributing to CO2 reduction through the circular economy concept of our ReOil process,” he stated. “Borealis’ proprietary technologies and market expertise can make significant contributions to the successful development of our partnership with Adnoc. As a committed, long-term partner to the UAE, Borealis and Adnoc have successfully built our joint venture Borouge. 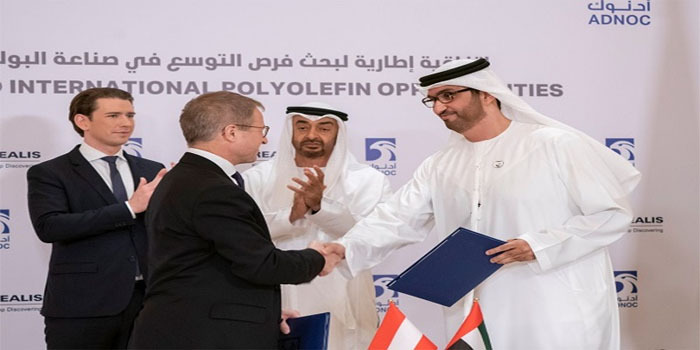 Building on our fruitful collaboration, we look forward to discovering value-add opportunities in the polyolefin industry with our trusted partner Adnoc, servicing our customers around the globe,” he added.